Summon units with a single touch! Support their attacks with magic! Take out lots of enemies at once with Oracles! Knights, archers, magicians...have fun combining different types of unit in a tactical way! Battles can consist of up to 3 players on each side! Assist your friends in battles and work together for victory! Work together and take on even the strongest of foes! Your favourite LINE charactersâ€”Brown, Moon, Sally, and the gangâ€”as you've never seen them before! They're looking cuter than ever dressed up as soldiers, magicians, and much much more, and ready for war! You can power up units by collecting several of the same card. 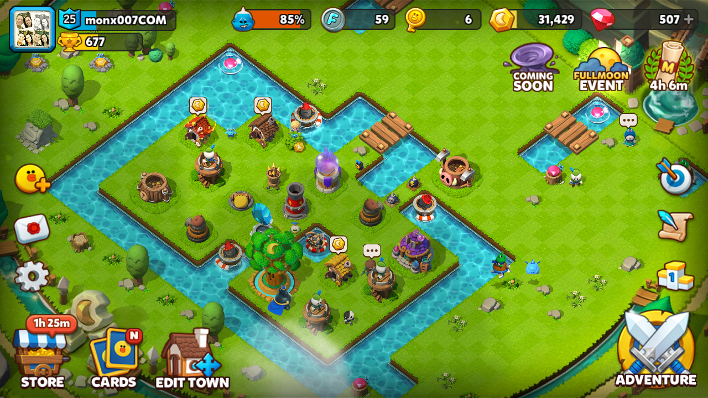 Build up your town so that you'll be able to hold out against enemy attacks! Place artillery, waterways, Brown's house, and more, to build up your defenses the way you like them! Then watch as Brown, Moon, and the rest of the gang run around the town. Win league battles (adventures) to get Hero Points! You'll move up the leagues as you get more and more Hero Points. Keep on fighting to make your order the best of the best! Wanna get to grips with the game on your own? Try story mode! The stages here are a bit different to what you'll find in adventure mode. Join Brown and his friends on their adventure! 001. New Moon building act like your headquarters. Defend it with all your strength! 002. Mineral Stones determine how much Defense Building you can build. But keep in mind, that every Defense Building may required different Mineral Stone. - You have upgraded all of your attacking units. - You have upgraded all of your magic that you are planning to use. - Your Oracle is ready for action! 004. To gain maximize rewards, try to complete all the mission at the story mode by reaching 3 star. If you have not reach the 3 star, you can re-take the mission, hopefully you can reach 3 star. 006. If you attack other town and the battle is over, usually you have a chance to use your available rubies to 'buy' or get available cards. But to optimize your cost, try to buy only cards that you've been used or planning to use. 007. If you have enough Water, try to reconstruct your town. Because, at default, your town will have 3 access roads (or bridges). It will be harder to defend your town, compare if your town only have 1 access road (or bridge). To have only 1 access road (or bridge), you must reconstruct your town. 008. The pattern attack of Princess Lina is a long wide area bombardment. So better you place your building not too close to your other buildings.